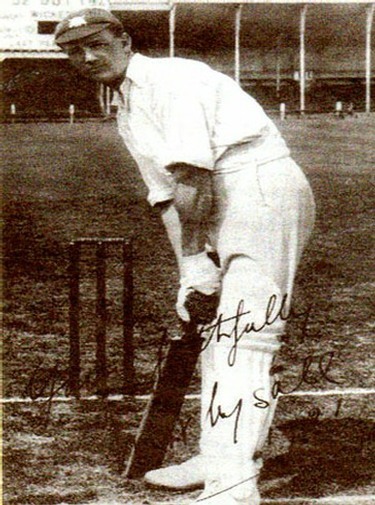 Bill “Dodge” Whysall, the first Nottinghamshire player to score four successive hundreds, was one of the greatest batsmen in the club’s history. Born in Woodborough, Nottinghamshire, on October 31st 1887, Whysall scored 20,376 first-class runs for the county between 1910 and 1930. Whysall achieved his feat of four consecutive centuries between July 2nd and July 11th, 1930. He scored 117 and 101 against Hampshire at Trent Bridge, 120 against the Australians at Trent Bridge and 158 against Warwickshire at Edgbaston. Whysall played four Tests for England, touring Australia in 1924-25 and in later years ran a sports shop in Mansfield, where he lived. A solid and dependable right-hand opening batsman, he died on November 11th, 1930, in freak circumstances. Out dancing in Mansfield, Whysall tripped up, banged his elbow and thought nothing of the incident. A few hours later, however, he contracted septicaemia due to his fall and was rushed to hospital, where he died four days later. Nottinghamshire librarian Peter Wynne-Thomas said: “Whysall is perhaps best remembered at Trent Bridge for his opening partnership with the legendary George Gunn the pair batted together during the 1920’s and had a great understanding”. Bill Whysall, who, with Kevin Pietersen (a more recent ex Nottinghamshire batsman), holds the record for the most centuries in a row for Notts.